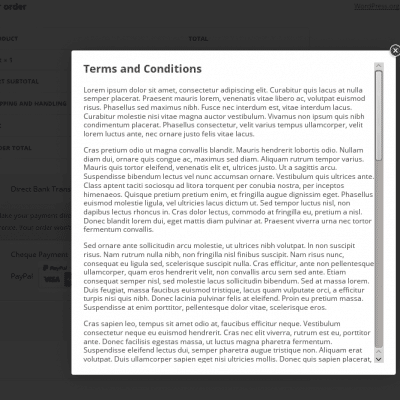 Want to show your WooCommerce Terms and Conditions in a lightbox popup window? This plugin does exactly that. It’s designed to help increase your sales conversions and reduce your abandoned carts by keeping your shoppers on your checkout page by showing your terms and conditions when they click the related link on your checkout page.. And it integrates directly with the same popup lighbox technology used by WooCommerce! WooCommerce Terms and Conditions Lightbox is an incredibly simple “set it and forget it” plugin — just install it, activate it, and you’re done!